Yes, the weather outside is frightful but it’s also delightful for outdoor activities including ice skating. And Rhode Island has some great hot spots for cold-weather fun on the blades, from the capital city to the frozen countryside. The Providence Rink at the Alex and Ani Center in downtown Providence has just about all your skating needs covered, from open public skating to public hockey to bumper cars to a college skate night. If your group, school, business or birthday buds want the place to yourself, the rink is rentable for private events. It’s located at Kennedy Plaza and a prime spot for families, couples, singles and groups. Rent skates here or bring your own gear – including helmets, which are mandatory and available for free with a deposit while you use them. Skating to music with the city’s cozy skyline as backdrop is, well, delightful. WARMUP: Bolt Coffee, located at the Dean Hotel on Fountain Street, a petite coffee bar with sleek décor and ample options to get toasty again. Down in Westerly, you’ll find the Washington Trust Community Skating Rink on Main Street, offering 12,000-square-feet of ice on a 100-by-120-foot rink, part of the offerings from the Ocean Community YMCA. 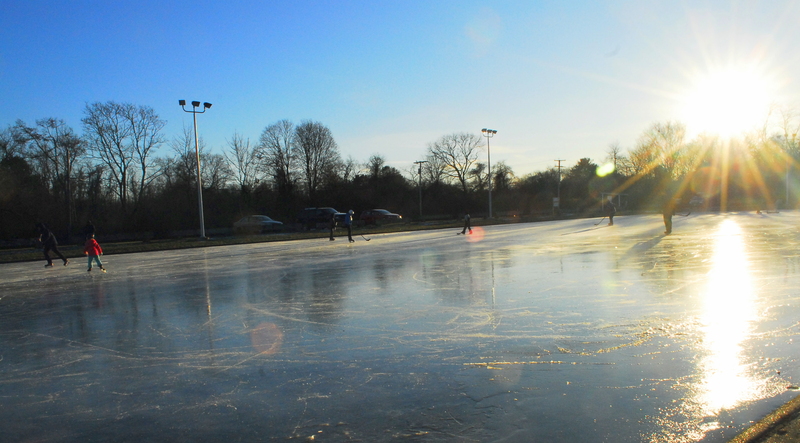 You can bring your own skates or rent a pair from the rink. You can twirl around the ice to your heart’s content, or if you’d prefer to watch, grab some seats on the benches, picnic tables and bleachers around the rink. The facility pretty much has all your needs in mind, from concession stands for food and drink to restrooms to free parking in the lot across from the entrance; take your ticket when you enter the lot and get it validated when you buy your skating passes. WARMUP: The rink has a concession stand, or you can wander over to IM Café Shop on High Street, with bakery items, breakfast and brunch, hot drinks and cold, including raw juice and smoothies. Skate in the City by the Sea at the Newport Skating Center on Commercial Wharf, a beautiful new facility built in 2016 and in the heart of all-things Newport, including many bars and restaurants to slake your skating thirst and quell your hunger pangs. It’s one of the more unique outdoor rinks you’ll find, embraced on all sides by architectural and historic splendor, along with some pretty cool water views. Rent gear here or bring your own and just enjoy skating by the sea. WARMUP: Take a short walk to Roasted and Brewed on Thames Street for all things coffee (regular, cappuccino, espresso, etc. ), teas, straight juice and blended stuff (think wheat and grass, for example), as well as a bunch of baked delights. The Legion Way Skating at the end of Legion Way in Barrington is about as old-time skating as it gets, a slab of ice frozen by nature. It started up a few years back when some local men took up the task of restoring the outdoor rink that had been dormant for decades, rounding up community-minded folks to do the volunteer work. In cold weather, the place is a hit, with a fire place to warm up by, logs to sit and change from shoes to skate, and no bathrooms: It’s about as basic as a rink can be – and the locals love it. WARMUP: Crepelicious, billed as a place that brings Paris to Rhode Island, is a tasty treasure trove of all things crepe, as well as a cool spot to heat up with hot chocolate after skating.